This article is about the English association football league. For the Tasmanian association football league, see Northern Premier League (Tasmania). For the English rugby union league, see North Premier. 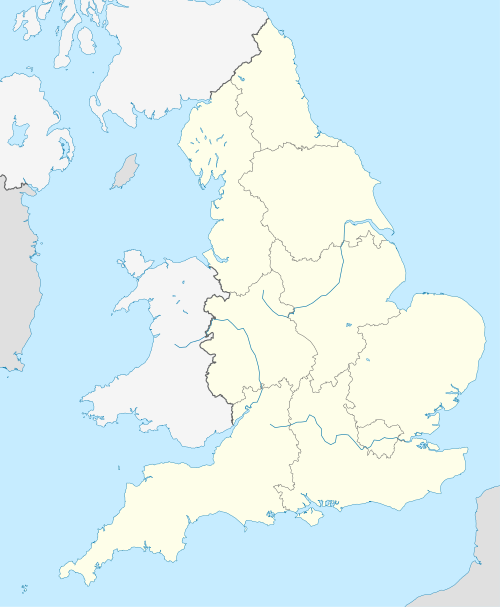 The Northern Premier League is an English football league that was founded in 1968. It has three divisions - the Premier Division (which stands at level 7 of the English football league system) - and Division One East and Division One West (which both stand at level 8). Geographically, the league covers all of Northern England and the northern/central areas of the Midlands. Originally a single-division competition, a second division was added in 1987: Division One, and in 2007 a third was added when Division One split into two geographic sections - Division One North and Division One South. In 2018 Division One was re-aligned as East and West Divisions. Successful teams at the top of the NPL Premier Division are promoted to level 6 of the pyramid (either National League North or National League South), and at the bottom end of the competition, teams are relegated down to level 9, where several regional feeder leagues promote clubs into the league. The Northern Premier League (NPL) was founded in 1968, as the northern equivalent of the Southern League, decades after the other two leagues at what is now the seventh tier of the English football league system, the Isthmian League and the Southern League. At that time they were the highest level non-League division below the English Football League, the same level as the other league in Northern England, the Northern League. Over the next two decades, the NPL successfully displaced its older rival to become the pre-eminent regional competition in Northern England, with the Northern League eventually forced to accept status as feeder league to the NPL. In 1979, upon the creation of the Alliance Premier League (which later became the Conference and is now the National League), the NPL became a feeder league and fell down one level in the English football league system, and with the then-Conference's addition of regional divisions in 2004 the NPL was demoted by a further tier and there are now two levels between it and the English Football League. From 1992–93 to 1994–95 the League's Division One included two non-English clubs, Caernarfon Town from Wales and Gretna from Scotland, who have later joined their countries' league systems. Colwyn Bay, Bangor City, Newtown, and Rhyl have also played in the league. In March 2018, the NPL's member clubs voted 37–27, with one abstention and three clubs' absence, to split Step 4 (level 8) divisions from east to west starting from the 2018–19 season. Due to title sponsorship deals, the league has been billed under various names, including a sixteen-year spell as the Unibond League, the longest such deal in world football. When this deal ended in 2010, a new deal was announced which will see the competition billed as the Evo-Stik League until the 2017–18 season. Since 2018, the NPL has had three divisions: the Premier Division, Division One East and Division One West. Prior to 2007 there was just a single Division One, and prior to 2018 Division One was arranged on a north-south basis. The Premier Division has 22 clubs, with the champions promoted to the National League along with the winners of a playoff between the second to fifth place clubs. Theoretically, clubs from the NPL could be promoted into either of the National League's two regional divisions, however, the geographical footprint of the NPL has never overlapped with that of the National League South, therefore (as of 2015) all promoted NPL clubs have been placed in the National League North. The bottom three teams are usually relegated to Division One East or West, however NPL Premier Division clubs in the most southerly locales could be placed in the Southern League Division One Central in the event of relegation. From the 2018–19 season, Division One East and West have 20 clubs each. In each division, the champions are promoted to the Premier Division, along with the winners of a divisional playoff. The bottom two clubs in each division are relegated to one of the feeder leagues below provided there are enough suitable promotion candidates from those leagues. The champions of the three feeder leagues covering the NPL area are promoted each season. These are the Northern League, the Northern Counties East League, and the North West Counties League. Clubs in the northern extremities of the Midland League and the United Counties League may also be promoted to the Northern Premier League. Should there be an unusually large or small number of clubs relegated to and/or promoted to the level of the NPL from Northern England, the National League System (NLS) Committee can order one or more of the NPL's southernmost clubs to transfer to the Southern League (or vice versa) to maintain numerical balance between the leagues. Division One North and South teams receive a bye to the Preliminary Round of FA Cup Qualification. Premier Division teams receive a bye to the First Round of Qualification. The league currently runs one cup competition, with all member clubs competing in the League Challenge Cup. In the past, the league has run other competitions, such as the Chairman's Cup, the President's Cup and the Peter Swales Shield. The league currently runs one cup competition, the League Challenge Cup, which is contested by every club in the league. In the past the league has run three other cup competitions - the President's Cup, Chairman's Cup and Peter Swales Shield. ^ a b "The Evo-Stik League Northern Premier History". The Evo-Stik League Northern Premier. Pitch Hero Ltd. Archived from the original on 24 December 2013. Retrieved 23 December 2013. ^ "Evo-Stik Northern Premier League Vote For East/West Split". Pitchero.com. 9 March 2018. ^ Allcock, Alan (2 May 2010). "Evo-Stik New Sponsors From 2010–2011". The Evo-Stik League Website. Pitch Hero Ltd. Archived from the original on 8 March 2011. Retrieved 23 December 2013. ^ Kirkbride, Philip (1 May 2010). "Northern Premier League secures new sponsor". Liverpool Echo. Retrieved 7 May 2010. ^ Watters, David (18 May 2012). "Sponsor commits to three more years on night of national honours and celebration". The Evo-Stik League Northern Premier. Pitch Hero Ltd. Retrieved 19 May 2012. ^ Watters, David (22 December 2013). "Christmas comes early for League!". The Evo-Stik League Northern Premier. Pitch Hero Ltd. Retrieved 23 December 2013. ^ "Evo-Stik Continue Northern Premier League Backing". Pitchero.com. 17 June 2017. ^ "CUP WINNERS CHALLENGE CUP". The UniBond League. Archived from the original on 23 July 2004. Retrieved 24 April 2013. ^ Snee, Tom (22 June 2011). "League Statement: President's Cup". The Evo-Stik League Northern Premier. Pitch Hero. Retrieved 7 November 2014. This page was last edited on 19 April 2019, at 15:24 (UTC).